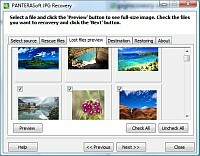 You are just in a click away from recovering your lost or deleted digital photos or jpeg files. From any memory card or digital camera or drive, even after format or reformat. Due to improved image recovery algorithms, PANTERASoft JPEG Recovery is the best recovery solution for image recovery, picture recovery, photo rescue, data recovery, photo restore or digital media recovery whether files were deleted, the media was corrupted or formatted. Optimized recovering of RAW photo files from Canon, Nikon, Sony, Konica Minolta, Rollei, Leica, Hasselblad, Kodak, Fuji, Olympus, Panasonic, Pentax, Sigma, Samsung, Mamiya, Adobe, Foveon and others. PANTERASoft JPG Recovery will recover lost, deleted and formatted digital photos on removable media. Works with every type of digital card reader appearing as a drive letter in your local PC. Our software is designed to help you recover digital photo files from media that is defective or damaged, as well as images that you may have inadvertently deleted from your storage media. 1. 'Scan' your card, stick, drive, cd, dvd, digital camera connection, reader or anything with a drive letter. 2. Use 'Check All' and 'Save' for saving to the directory you want. All photos rescued now. No knowledge required.